I woke up in the middle of the night with this idea–sort of a meta-idea, an idea about ideas, and how some of them evaporate, and some develop into maturity. In a previous post, we talked about using lists to generate ideas, and that only a small percentage of them would be “good.” This isn’t about good ideas, but rather the development, because even good ideas will wither and die without embodiment. This means to put it someplace it can take root, like a seed, or an embryo. For this particular idea, it meant grabbing the cell phone I keep by the bed. Sometimes that means using a voice recording app. Sometimes, I dictate into Evernote, which is what I did this time. (By the way, turned out not the best, since it got “creative” with something I said, and now I can’t remember what the original word was.) That made sure it wouldn’t simply evaporate, leaving me later with only the feeling that I had had an idea. That means exploring around the concept. What is this idea, really? What are the related ideas? What are the implications? How to I support it (that is, explain it or prove it)? In probing around with it this morning, I realized I was thinking a quite literal “embodiment”–both giving the idea a body (“give it legs”), and living with it within my own body–taking it in, rolling it around in my brain, letting it gestate within me. Apologies to those of you with young females in your household for the tune that is now, no doubt, playing in your head. Though my family were not farmers, I grew up in a farming community, which means I learned a few things through observation. For instance, if you want a crop in the fall, you have to plant in the spring. And you don’t manufacture a crop, you grow a crop, which means supporting it but otherwise letting it proceed at its own pace. Pulling it up every day to check the roots is not helpful. Some ideas grow faster than others. This one is useful for today’s blog post. It’s not book level–at least, not yet. It may be a chapter one day, but it has to grow more. The growth phase for an idea for me involves observation as much as cultivation–seeing how tendrils extend out and connect with other ideas, how the roots grow, the shape the leaves take. If agriculture is one useful metaphor, bonsai is another. You can bend, shape, prune, but you can simply make the tree, not if it’s going to be a living thing. I have some notes now for a related post on ritual, and it’s germinating over there in its own little starter pot. This is where I start writing, but it’s definitely rough draft. We have talked before about the need to separate the writing process from the polishing/editing process, and this is part of that. I don’t yet know what the idea will be when fully formed, but rough drafting is part of the growth process. Rough drafting is, quintessentially, embodying. It’s giving the idea its own body, and just as with your children, ideas have a life of their own and develop differently than what you might have envisioned when you started. Writers often talk about their experience of following their characters around to see what they are going to do, intending for them to walk down to the corner and turn right, whereas instead they get in the car, drive across town, and turn left. For control freaks, this is frustrating, but it is what you must have if you want something that is living and breathing rather than a mechanical monster. Sometimes the changes surprise you. 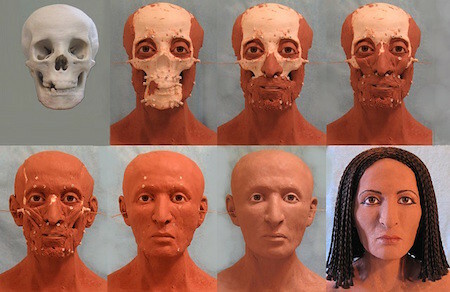 The first image I had at the top reflected my original concept of “putting flesh on the idea,” pulling from the field of forensic facial reconstruction. But as the idea developed, it naturally went toward more of an agricultural/gardening metaphor (with a little bit of child-rearing showing up). So the image at the top changed. This is painful. You know you are pruning something that is alive. It feels violent. But for greatest health, it must be done. We have hedges in front of our house that have not been pruned in years. They are out of control and causing all kinds of problems, for themselves and us. Eventually, ideas must be pruned. For me (and this idea), this is the rewriting and editing phase. 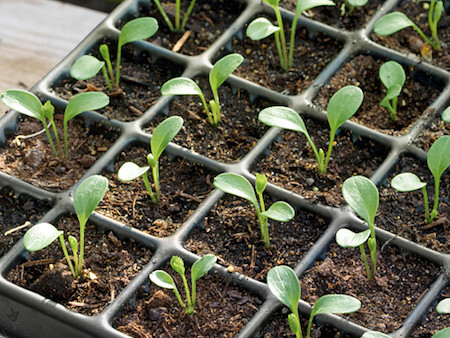 The overall point: there is a process for cultivating ideas, just as there is a process for cultivating plants. You are more likely to use your own process more effectively when you become aware of it and make decisions about it. You can’t control the production of ideas any more than you can control the production of seeds–but you can decide which ones to cultivate and which ones to weed out. That, my friends, can yield a lifetime of crops. What is your process for nurturing an idea to maturity? Hi Donn. Thank you for your column. It is my “mental” treat every day.